Introduction: Feeding tube placement can be difficult in patients with abnormal anatomy after surgery. In addition, some patients cannot tolerate gastric feedings and require the feeding tube to terminate distal to the pylorus, eliminating the possibility of using percutaneous gastrostomy tubes. Blind placement of feeding tubes has multiple complications including pneumothorax, pneumonia, and empyema. Multiple endoscopic techniques for feeding tube placement have been described however all have limitations and most of the time the feeding tube is pulled back into the stomach with removal of the endoscope. Interventional radiologic placement is used more frequently, however radiation exposure is significant and undesirable; a safe, efficacious, and cost-effective alternative is desired. Methods: We report a series of four consecutive cases of endoscopic clip-assisted nasoenteral post-pyloric feeding tube placements, accompanied by a step-by-step illustrated overview of the technique. All the patients had undergone emergent gastric and duodenal surgery and required post-pyloric feeding tube placement due to gastric outlet obstruction. General surgery was consulted after multiple attempts at blind placement were unsuccessful. We begin by placing a looped absorbable suture at the 25cm mark on the feeding tube. The end of the feeding tube is then placed distal to the pylorus under direct visualization using endoscopic forceps. The feeding tube is then secured by clipping the suture to the gastric mucosa using an endoscopic clip. The clip prevents migration of the feeding tube into the stomach. Results: We used this technique to successfully place nasoenteral feeding tubes into the distal duodenum in four consecutive cases. All cases had post-pyloric feeding tube placement and no case had to be repeated due to migration of the feeding tube into the stomach with removal of the endoscope. One patient had accidental removal of their feeding tube one week post placement and required replacement using the same technique. All cases were done at the bedside under conscious sedation. There were no procedure-related complications, and no bleeding or perforation due to removal of the feeding tubes was observed. 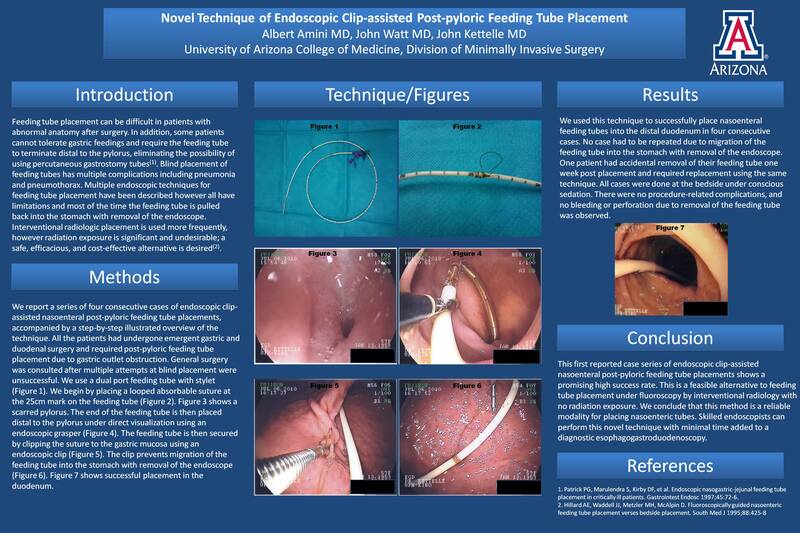 Conclusion: This first reported case series of endoscopic clip-assisted nasoenteral post-pyloric feeding tube placements shows a promising high success rate. This is a feasible alternative to feeding tube placement under fluoroscopy by interventional radiology with no radiation exposure. We conclude that this endoscopic clip-assisted method is a reliable modality for placing nasoenteric tubes. Skilled endoscopists can perform this novel technique with minimal time added to a standard diagnostic esophagogastroduodenoscopy. Larger comparative studies are warranted.